What Are The Best Anti-Aging Nutrients? 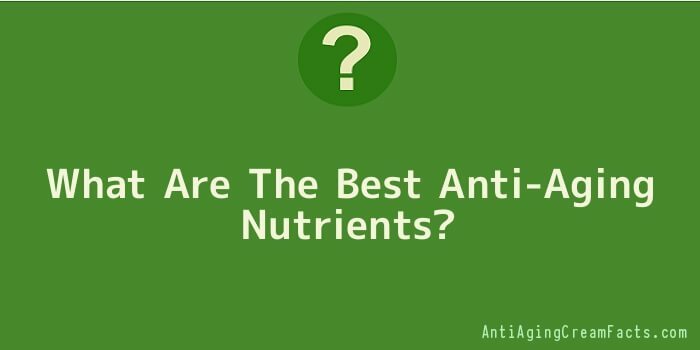 What are the best anti aging nutrients and how can you work them into your diet and your life? The good news is there are a number of nutrients that will indeed slow the aging process and keep you healthier while doing it, and they are not difficult to find, expensive to buy, or hard or work into your daily routine. Some of the best anti-aging nutrients can be consumed as food, while others are easier to take as daily supplements. What follows is a list of some of the best anti aging nutrients and supplement along with advice on how to take them. Antioxidants are most commonly found in vitamins A, C, and E, and in alpha lipoic acid and any food containing beta carotene. Vitamins consumed in food enter your system more effectively and more quickly than vitamins found in supplements, but a daily supplement is a good idea any since anything your body doesn’t use will easily be discarded as waste. Another reason for taking a daily supplement is that only 10% of all carotenoids are found in the food we eat. Beta carotene is found naturally in deep yellow or orange foods like carrots, winter squash, and red peppers. Antioxidants are also plentiful in deep green leafy vegetables. Antioxidants neutralize “free radicals,” which are waste chemicals and toxins produced by the body that contribute to aging and disease. This specific antioxidant is found in red meat and yeast and helps extend the effectiveness of other antioxidants (like carotenoids) and also helps to convert food into energy. Many Americans now limit their consumption of bread (a main source of yeast) and red meat, but happily, you can also take alpha lipoic acid in supplement form. All of the B vitamins help to combat aging and also help to maintain energy, but a specific B vitamin compound called choline often decreases with aging. Choline supplements are available at most health food stores. Selenium is a mineral that is often included in a daily supplement and helps to combat aging by guarding against immune system dysfunction and combating certain cancers. Lots of herbal supplements have been found to be among the best antiaging nutrients. Gingko biloba has been found to improve memory and alertness. Black Cohosh is alleviates menopause symptoms without hormonal intervention. “Super Foods” like monounsaturated fatty acids (MUFAs) found in salmon, olive oil, and canola oil help to protect the heart and keep skin elastic and supple. Spirulina, chlorella, barley grass, and green tea are all bright green foods (found in most health food stores) that are super-packed with micronutrients and antioxidants that promote healthy body functioning and slow the aging process. These foods can be added to shakes, dressings, or salads, or can be taken as supplements. Once you are aware of which foods contain the best anti aging supplements and nutrients, you can begin to work them into your diet and your life. When it comes to foods, look for deep, bright colours and minimal or no processing–yams, winter squash, Swiss chard, spinach, broccoli, Brussels sprouts, tomatoes, oranges, strawberries, blueberries red peppers, pumpkin, carrots—and also lean red meats and eggs or else alpha lipoic supplements to replace the nutrients found in these. Berries, especially blueberries, are so packed with anti aging nutrients it is worth adding a handful to at least one meal per day. Add a good multivitamin supplement to your daily routine, and consider other supplements too such as Gingko Biloba, Selenium, B Vitamins, and Choline. Ginger, Fish oil, and garlic supplements are also very useful anti aging nutrients. Consider making a daily shake that includes wheat grass or Spirulina powder, and substitute green tea for coffee or soda as many times per day as you can. Knowledge is power. Once you know what to eat for maximum anti aging effects and which supplements to take, you are well on your way to a healthier, fuller, more energetic life.